Fourteen members of one family have died in an air strike on rebel-held east Aleppo, volunteer rescuers say. Eight children and two women were among the dead, said the civil defence force known as the White Helmets. An Aleppo resident told the BBC the city had endured heavy bombing in the past 24 hours, with "bunker-buster" munitions shaking the ground. 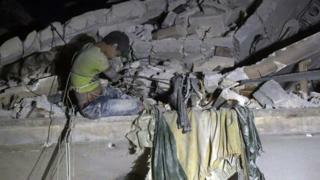 The EU foreign affairs chief has said sanctions against Syria might be expanded. But Federica Mogherini said increased sanctions against Syrian President Bashar Assad's Russian backers were not on the agenda. She was speaking as EU foreign ministers met in Luxembourg. The family died in the al-Marja area of the city on Monday, after what the Syrian Civil Defence force said was a strike by a Russian jet. Rescuers used a crane to extract a 12-year-old boy from an upper floor after part of the building collapsed on his legs, and they later carried a dead baby from the rubble, her face caked in mud, AFP reported. In a BBC interview, a teacher in Aleppo described the latest wave of air strikes: "They are using a new kind of weapons. The same bunker-busters but they are stronger. The earth would shake for longer time. We had to wake up about five or six times. This is the first time it happened like this." A ceasefire in Syria brokered last month collapsed after just a few days. Since then Syrian forces, backed by Russia, have been bombing the city of Aleppo - the most high-profile battleground in the country's civil war - in what Washington has called a war crime. Aid agencies say a 72-hour ceasefire is urgently needed to allow supplies in and civilians out of devastated areas in the rebel-held and government-besieged east of the city, where 275,000 people live. The US and UK warned of new sanctions in response to continued air strikes on Aleppo following talks in London on Sunday. US Secretary of State John Kerry said "crimes against humanity" were taking place daily in Aleppo, after meeting his British counterpart Boris Johnson. Mr Johnson said that additional sanctions on the Syrian regime "and its supporters" were under consideration, as measures designed to "keep the pressure up". Britain, France and Germany are expected to push for strong condemnation of the Russian and Syrian bombings at the EU meeting in Luxembourg on Monday. According to Reuters, diplomats say a fresh ceasefire with an observation mission, a renewed push for peace talks, access for EU aid and proposals for economic sanctions on some 20 Syrians suspected of directing attacks on civilians are all likely to be discussed. North of Aleppo, Turkey said it had largely regained security on a key stretch of border. The Turkish military said Turkish-backed rebels had seized control of nine areas from the Islamic State group, including the symbolically important town of Dabiq, 10km (six miles) from the border, on Sunday, Reuters reports. Why is Dabiq so important for IS? A war that started with an uprising against President Assad has now split Syria into many parts. It has been going on for more than five years and has claimed 300,000 lives.